Raising $12 billion last month now looks like the easy part of Deutsche Bank’s renewal. The German lender is, it emerges, under fire from United States regulators for a raft of procedural failings. Deutsche may have repaired its capital position and revamped its strategy this year. But persuading investors the bank holds itself to higher standards than before the crisis is starting to look like a generation’s work. The Federal Reserve Bank of New York voiced disapproval to Deutsche in December, according to a letter leaked to the Wall Street Journal. The charge-sheet is serious. Deutsche’s inadequate housekeeping stretches back to 2002. Worse, the watchdog found the bank had failed to make any progress in fixing previously flagged failings. Other big banks’ reporting systems have also been found wanting since the crisis. There were 800 IT-system data points that the FRBNY says Deutsche should have automated that were actually manual entry. That echoes the shoddy spreadsheet skills unearthed at JPMorgan during the “London Whale” trading fiasco. The U.S. Federal Reserve lambasted Citigroup in March for lacking robust processes to project losses and measure exposures. Bank of America Merrill Lynch, meanwhile, revealed in April that it had been miscalculating its capital position. Are Deutsche’s lapses any worse than its peers’? The scale of the response matters. Deutsche has earmarked 1 billion euros to fix its controls, and has 1,300 staff working on the repair job, with another 500 on the way in America. But that is not to say Deutsche could not do more. The long list of administrative slips suggests co-Chief Executives Anshu Jain and Juergen Fitschen have been slow to grapple with failings. That is certainly the message from New York’s banking regulator. Jain and Fitschen pledged that Deutsche would be at the vanguard of cultural change in the industry when they presented a new strategy two years ago. Since then the bank’s shares have fallen a fifth, versus a 30 percent rise for the Eurostoxx bank index. Deutsche wants to use its strengthened capital position to ram home its advantage as Europe’s biggest global universal bank. That is plausible in theory. In practice management’s focus will need to be internal for years to come. 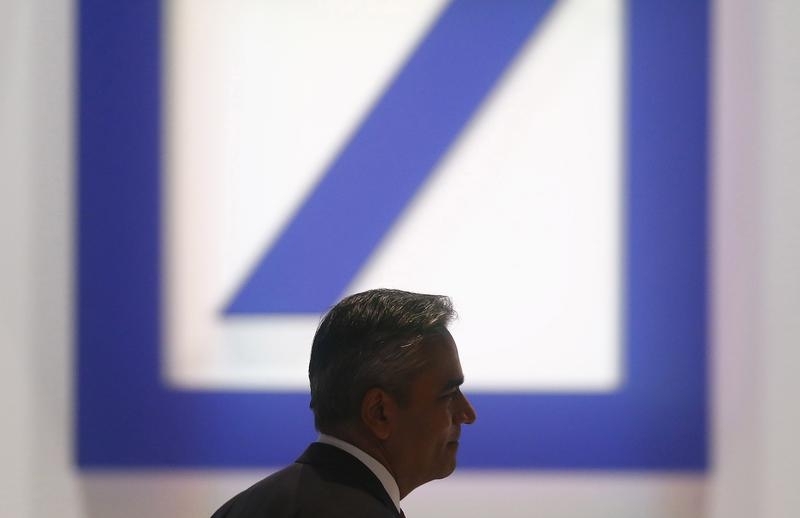 Deutsche Bank shares fell as much as 2.7 percent on July 23 following a report in the Wall Street Journal that the German lender had been castigated by U.S. regulators for producing “low-quality, inaccurate and unreliable” financial reports over several years. The Federal Reserve Bank of New York in a December letter to Deutsche, seen by the WSJ, said that the bank needed to take “wide-ranging remedial action” following a “systemic breakdown” in its controls. The watchdog told Deutsche to give the failings “immediate attention,” claiming that “no progress” had been made in fixing identified problems first flagged in 2002. One specific area of concern for the FRBNY was that Deutsche had made “multiple manual adjustments” to 800 pieces of data representing $337 billion in value. By 1000 BST, Deutsche Bank shares had recovered partially to stand 1.7 percent down at 26.20 euros.